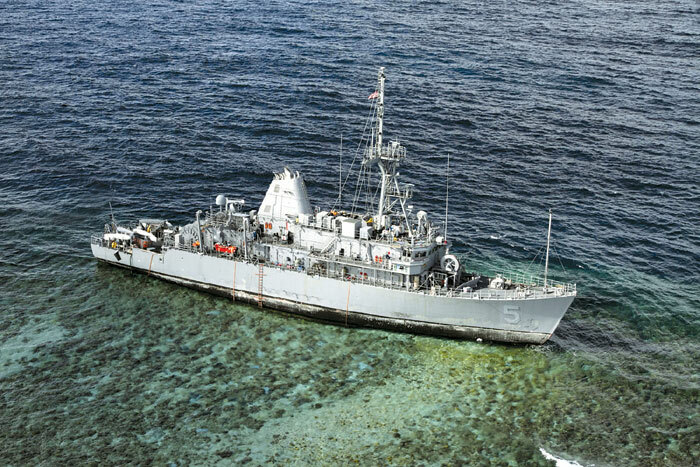 HONOLULU (AP) — The U.S. Navy plans to dismantle a minesweeper that ran aground on a coral reef off the Philippines because the ship is a complete loss and because removing it intact would cause more damage to the reef and the ship’s hull, a spokesman said Jan. 30. There’s also a chance the vessel might break up or sink if crews tried to remove it without taking it apart first, U.S. Pacific Fleet spokesman Capt. Darryn James said. Limiting damage to the coral, which is part of a national marine park, is important to the Navy, James said. “We really do care about being good stewards of the environment,” he said by telephone from Pacific Fleet headquarters in Pearl Harbor. The Navy has presented the ship removal plan to the Philippines, which is reviewing it. It is expected to take more than a month to dismantle USS Guardian, which ran aground before dawn on Jan. 17. Crews have already removed 15,000 gallons of fuel from the ship and have taken off hundreds of gallons of lubricating oil and paint. They will also be removing human wastewater and other materials that could harm the environment, James said. The U.S. Navy is hiring floating cranes to help with the removal. A contractor in Singapore is sending the cranes. No one was injured when the ship ran aground at the reef in the Tubbataha National Marine Park. The park is a World Heritage Site in the Sulu Sea, about 400 miles southwest of Manila. Guardian was on its way to Indonesia after making a rest and refueling stop in Subic Bay, a former American naval base west of Manila. Vice Adm. Scott Swift, the U.S. 7th Fleet Commander based in Yokosuka, Japan, has ordered an investigation into the grounding.